In 2000, Ven. Bhikkhuni Santini Theri, better known as Ayya Santini, became the first modern woman to be ordained in the Theravada Buddhist tradition in Indonesia. Now the abbess of Wisma Kusalayani, a women’s hermitage in Bandung, West Java, Ayya Santini represents a new wave of female Theravada monastics ordained in Asia, and has devoted much of her life to reviving the bhikkhuni sangha in her home country. Ayya Santini has since been invited to participate as a preceptor at ordination ceremonies in Australia, and teaches the Dhamma from her home monastery in Indonesia as well as abroad. The United Nations named her one of 2007’s “Outstanding Women in Buddhism” for her work in reviving the bhikkhuni sangha. Buddhistdoor Global: When did you decide to become a nun? Why did you decide to take vows? Ayya Santini: When I was around seven years old, I saw a bhikkhu who was giving a Dhamma talk. At that time, young as I was, I knew something: that this kind of life would suit me. At the age of 25, I felt the time had come to live a samana life. But long before that I had been told that it was impossible to be ordained as a Theravada bhikkhuni because the bhikkhuni sangha was extinct. Believing that information, I decided to live as an anagarika* for several years. However, in 1999, my mind opened up after learning that chapter 10 of the Cullavagga** reads: “Tatthagatha allowed monks to give ordination to a woman to become a bhikkhuni.” With this in mind, three Dhamma friends and I decided to take vows as bhikkhunis, and on 15 April 2000 we received full ordination. BDG: What is the Theravada Buddhist community like in Indonesia? AS: The Theravada community here has developed quite well, both in terms of quantity and quality. Interest in meditation has also increased in the last 10 years. BDG: Before you ordained in 2000, there were no living bhikkhunis in Indonesia. Why did you want to receive full ordination? What difficulties did you face? AS: That was the situation before 2000. I wanted to receive full bhikkhuni ordination because I came to the realization that there were legal grounds for the bhikkhuni ordination process. Life is a matter of choice and I had the right to choose a life as a bhikkhuni in search of liberation, to become free from samsara through what the Buddha taught, showed, and achieved. We all know that the Buddha established the four pillars: the bhikkhu sangha, the bhikkhuni sangha, upasakas, and upasikas,***** but until then only three pillars were available. As a Buddhist, I had no doubt that we had a duty to uplift one of those four, which had disappeared for more than 1,000 years. Yes the bhikkhuni sangha had disappeared, but we Buddhist women could and should revive it! I strongly believe that what happened in April 2000 will inspire other women to take the spiritual life, as taught by the Buddha. Upon returning to Indonesia after ordination, we encountered many people who were for and against us. However, we did not view it as a big problem. The choice to become bhikkhunis is our right, and it is not a bad choice. What others think is their right and if they do not agree with our decision, that is their problem, not ours. There are so many things to do and so little time. We cannot waste time attending to them. We are busy doing meaningful, wholesome actions in this short life, developing what should be developed and erasing what should be erased. I think those who are against us are those who do not want women to progress in the Dhamma. We are all Buddhist disciples, so we must follow the Buddha, not them. As long as we walk in the Dhamma, the Dhamma will protect us! 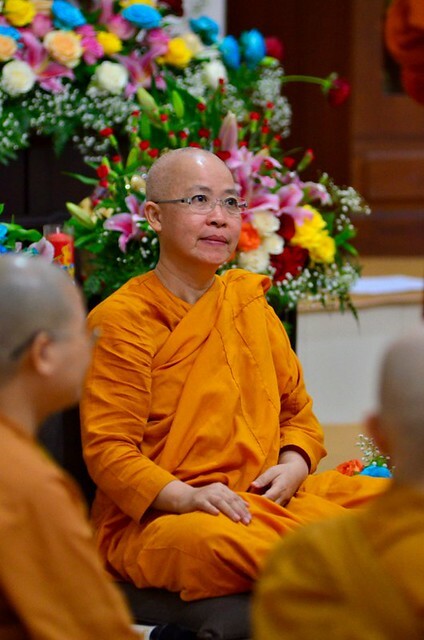 BDG: In 2015, several more women became bhikkhunis in Indonesia. Do women have more opportunities for full ordination now? Are attitudes toward female ordination changing? AS: Yes, now women have more opportunities to become fully ordained, because the path there has been paved thanks to those who have helped to make it possible. Now we can clearly see the positive changes. We receive more support from bhikkhus and lay people. They welcome the revival of Theravada’s bhikkhuni sangha and they openly support the daily needs of bhikkhunis. BDG: You won the UN’s Outstanding Women in Buddhism Award in 2007. What was your reaction? AS: The award was certainly not for me personally! It was for the movement to revive Theravada bhikkhuni ordination. The award was a clear gesture for Buddhist women who have dared to go against the mainstream by receiving full ordination as bhikkhunis. I was just a representative, simply that. BDG: What are your hopes for the future of Buddhist women in Indonesia? AS: I hope that the other three pillars of Buddhism—bhikkhus, upasakas, and upasikas—come to the realization that the revival of the bhikkhuni sangha is important for completing the four pillars established by our great teacher, the Buddha. Working hand in hand and in harmony, the four pillars can strengthen the quality of Buddhism. In today’s dark conditions, where there is much bad karma in the form of violence, corruption, terror, etc., there is a strong need to spread loving-kindness and to teach the Dhamma to our communities. To Buddhist women who want to live a samana life, I hope they have the courage to implement it, not only to dream or plan. Let’s not let this golden opportunity go to waste. This life is so precious. The next life? We don’t know even whether we will be born as human beings. To my Dhamma sisters, the bhikkhunis, now that we have decided to live this samana life, let us live with an undeterred focus to go in the direction shown by our teacher, Sammasambuddha. Slowly, perhaps, but surely, we must move closer and closer to liberation: nibbana. May all beings be well, happy, and peaceful. May the best come to us all. * One who has given up worldly possessions and responsibilities to commit to full-time Buddhist practice. ** A section of the Vinaya, or monastic code of conduct. *** Persaudaraan Bhikkhuni Theravada Indonesia (The Indonesia Theravada Bhikkhuni Fellowship). **** The Indonesia Buddhayana Council. ***** Also known as the fourfold sangha: bhikkhus, bhikkhunis, upasakas (male lay followers), and upasikas (female lay followers.